June 11 – India and Myanmar formally committed to strengthening their bilateral trade and infrastructure investment relations during last week’s World Economic Forum on East Asia. 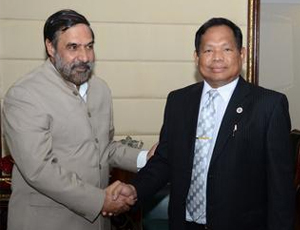 During the forum, India’s Union Minister of Commerce, Industry & Textiles Anand Sharma met with Myanmar’s Chairperson of the National League for Democracy Daw Aung San Suu Kyi to discuss trade between the two countries. Their meetings were positive, and the two agreed on greater cooperation and cross-border investment efforts. Furthermore, several areas of joint interest were discussed during talks between Mr Sharma and Myanmar officials, particularly in the IT and agricultural sectors. As a result, India will establish IT educational facilities in Myanmar through a grant assistance program in addition to the establishment of an Advanced Center for Agricultural Research. “Myanmar is a vitally important neighbor for us. The relations between our two countries have broadened and deepened in the past two years,” said Mr. Sharma during his speech at the World Economic Forum. Mr. Sharma also met with Myanmar’s Minister of Communications and Information Technology U. Myat Hein during the forum to discuss the development of Myanmar’s telecommunications industry. Myanmar is currently looking for outside investment and is accepting bids for two mobile licenses. India will also share its garment and textile expertise with Myanmar after a deal was reached for the country to provide Myanmar with US$5 million in credit to revitalize Myanmar’s garment industry. The agreement will facilitate a greater number of joint ventures between private companies from India and textile factories in Myanmar. Representatives from each country’s textile sector will also work together to formulate a common compliance code and standards of best practice for garment products produced for export in Myanmar. The two countries further discussed transportation networks that are key for cross-border trade, including a tri-lateral highway that will serve India, Thailand and Myanmar. A Joint Working Group is to be established to discuss the possibility of creating a cross-border rail link and direct shipping link between India and Myanmar. Finally, India extended another line of credit worth US$150 million to Myanmar for the establishment of a Special Economic Zone in Sittwe – a coastal city with port infrastructure that has been jointly developed by India and Myanmar. Indian companies have already invested over US$250 million into Myanmar. Trade between India and Myanmar rose 10 percent last year, with the two countries exchanging US$1.8 billion in goods and services. They hope to reach US$3 billion in bilateral trade by 2015.